Soccer drills with cones works on the players dribbling and controlling the soccer ball with a finishing shot on goal. When I coach players, I have them train with a mix of straight line cones, zig zag cones and other creative ways that gets more touches, turns, and encourages close control. There are two ways of doing this exercise, and the picture below is the option that maximizes touches on the soccer ball. Player will start this ball control soccer drill by turning his/her back to goal. Control the soccer ball through the cones all the way to the end. Once at the end, turn around the last cone and continue with dribbling the soccer ball through the cones again, bringing the ball to the starting point. When there are more players than 1 or 2, simply create another line of cones for players to return through and shoot on goal. Two green cones are there so that the player can pick left or right side to make space and follow up with a shot on goal to complete 1 repetition. Keep the soccer ball close to your feet, and try to touch the ball with every step. Focus on technique and control, rather than speed. 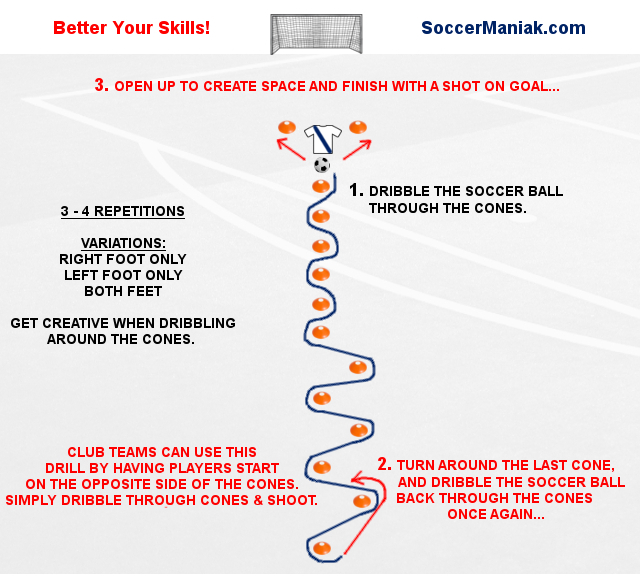 Roll the soccer ball, and get creative with controlling the soccer ball around the cones. Any soccer drill can be used to make your own version of the drill. As long as you put the time and effort, touches will improve.